Performances, arts, music and more make up the culture of Quebec. Québec cultures reflect the diverse melting pot of many cultures that came together at this spot in Canada through trading and migration. Influenced by the First Peoples, the English and the French, today's Québec cultures reflect the many immigrants who stepped ashore bringing with them their rich tradition of music, food, architecture and theater. Like other places in North America that welcomes immigrants, Québec's cultures reflect the people who settled there. Groups from England, Ireland, Scotland, France and the United States came together to trade, settle and share their rich tradition of architecture, music, food, and theater. The result is today's vibrant Québec cultural scene. French-speaking Acadian people from New Brunswick and Nova Scotia. Maritime tradition, which brought the music and folk arts of other countries, such as Ireland and Scotland, into Québec through sea trade and commerce. Climate, because Québec's harsh winters called for a different architectural style than the original settlers knew in France. As new people settled in Québec, they brought with them their own traditions and ideas of culture. As with many parts of the world as each group assimilated, a little of their culture found its way into the major Québec cultural scene and is reflected in today's diverse offerings. Each group of settlers contributed some cultural aspects to modern Québec cultures and traditions. In general, the cultural shifts in Québec over the years mirror the cultural shifts found throughout the major areas of North America. The First People influenced Québec culture by sharing their place names with the first settlers. They taught the original settlers about native animals and plants, and shared with them the best techniques to navigate and live in the new world. Although today many people think only of the French when they think of Québec cultures and influences, the First People had a great impact upon the original formation of Québec life. Eleven tribes living in the area each contribute something different to the formation of today's Québec cultural identity. 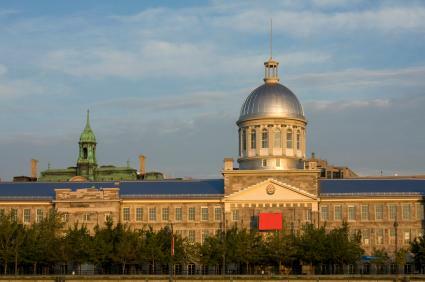 The French language in the form known as Québecois binds and ties together all aspects of Québec cultural heritage. French culture permeates Québec. Much of the area's arts, music and food owes a debt to the original French settlers. For example, just as the French love jazz music, Québec today offers a rich diversity of jazz performance and is famous for a summer jazz festival. Québec's cultures have links to other Canadian French-speaking groups, notably the Acadians of New Brunswick and French-speaking groups found Ontario and Western Canada. In addition, Québec was influenced by an influx of French-speaking people from Louisiana in the United States, who brought with them the unique Creole style from that area. English music, particularly Irish and Scottish music, heavily influence Québec folk music. The dance form known as the reel became popular and echoes of the original Celtic tunes can still be heard in modern Québec folk music. The English contributed to folk customs too. The original Québec settlers followed French dining customs, such as dining very late in the evening. As the British came to the area, particularly Montreal, their ways of eating early in the evening and settling a table with the knife and spoon to the right and the fork to the left of the plate caught on. Other British influences may be seen in architecture, particularly the variety of Victorian style buildings in Montreal. Since the 1960's, modern Québec cultures are influenced not so much by waves of people coming in, but by Québec people themselves looking out into the world for inspiration. Some people look to Paris for the latest trends, while other seeks cultural inspiration from New York City. Modern Québec people tend to have a very open mind when it comes to enjoying everything from music to food. You can hear any type of music throughout Québec, from jazz to sambas, and enjoy food from around the world. While the original British, French and Native American Québec cultures can still be felt, the world has come to Québec, just as Québec has come to the world.